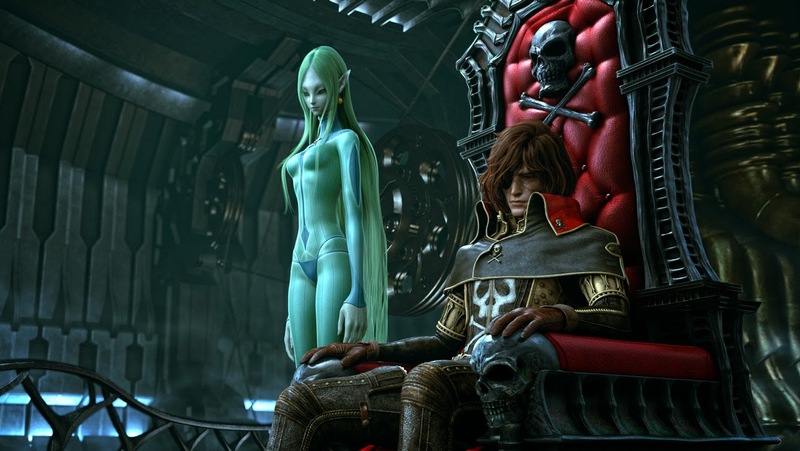 Harlock Space Pirate, based on the work of 1950's manga artist Leiji Matsumoto, is director Shinji Aramaki's latest foray into the realm of full CGI animated feature films. After his generally well received reboot of the Appleseed franchise, Aramaki returns with another highly polished blockbuster rebooting another beloved franchise. It is the year 2977 and 500 billion displaced humans long to return to the planet they still refer to as home. Captain Harlock is the one man standing between the corrupt Gaia Coalition and their quest for complete intergalactic rule. Seeking revenge against those who wronged both mankind and himself, the mysterious space pirate roams the universe in his battle cruiser, the Arcadia, defiantly attacking and pillaging enemy ships. Gaia Fleet leader Ezra sends his younger brother, Logan, to infiltrate the Arcadia and assassinate Harlock. But Logan will soon discover that things are not always what they seem and that legends are born for a reason. First and foremost, the animation in this film is ridiculously good. Granted, back in 2004 when Appleseed was released I thought the same but this, this is something else. Somehow the characters and animation manage to marry up in such a way that they maintain their anime aesthetic without falling into the trap of looking cartoony. Instead we end up with characters who are impossibly attractive and still far removed from the pitfalls of the "uncanny valley". Not only do the characters look great but so too do the mechanical designs and space battles which is pretty darn important in a film about space piracy. The space conflicts look fantastic with bright, vivid flashes of weapon fire streaming across the screen and billowing from the Dark Matter engines add to the overall combat theatrics but they eventually count for nought. The story really relies on the fact that you're already well acquainted with the world of Harlock or simply don't care what's going on. Samplings of dialogue are incredibly derivative and abound with enough technobabble to make even Captain Shatner proud. That said, I couldn't care less. When I watch Sci-Fi, someone could say "ready the Dark Matter Solar Cubic Rambunmunqualiser!" and I wouldn't bat an eyelid. Plot twists, however, are a different story. 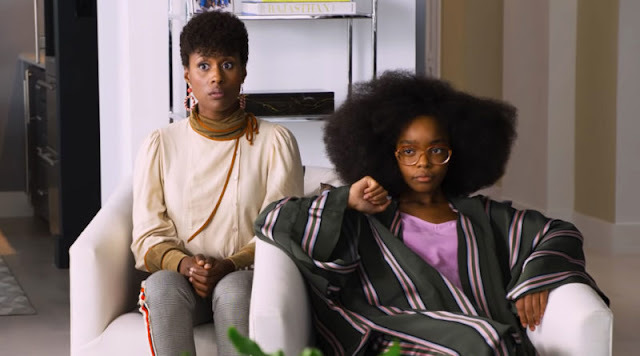 Unfortunately about mid-way through this film there is a plot twist that completely changes the course of the story and unravels other threads of story that were previously thought to be woven. It's from this point on that looks matter because the story all but goes out the window. The voice work throughout is solid in both the English and Japanese languages. David Matranga, known for his role as Briareos in Appleseed, pours on the angst as the titular character while Shun Oguri (Azumi, GTO) perfumes in the native Japanese voice. As usual, it's up to personal choice whether you watch in English or Japanese but sadly such quality animation is completely unforgiving when it comes to lip synching voice over. The English dub simply does not marry up with the mouths of the characters and in the interest of being positive, this is only a negative because the animation is so fantastically intricate. In terms of visual spectacle and 3D emersion, Harlock Space Pirate is an absolute triumph and a damn fine action space-opera. However, if you're after a self contained story and something a little more fulfilling than a smattering of space battles, perhaps this isn't the film for you. But in my books it still earns an extra marks for incredible animation and, well, space pirates. 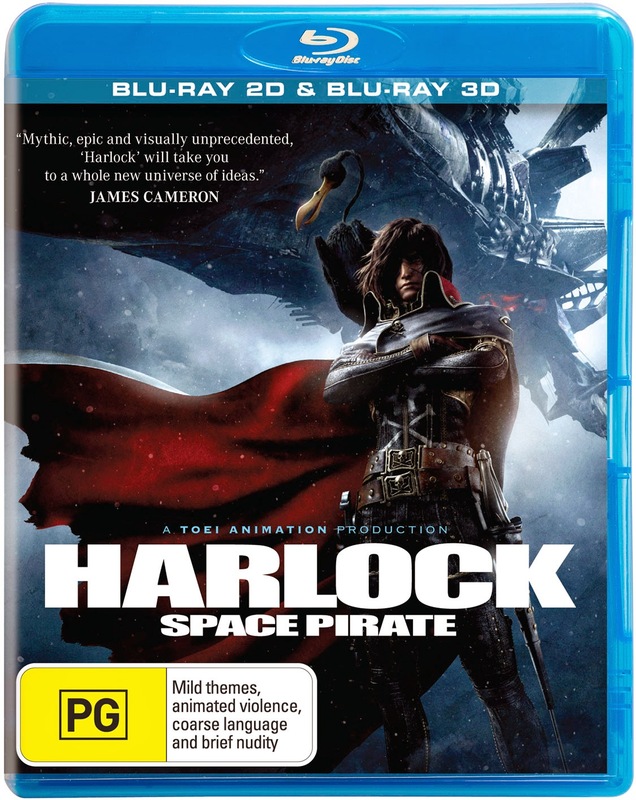 Harlock Space Pirate is available now on Blu Ray, 3D Blu Ray and DVD from Anchor Bay. I think it goes beyond personal choice. To me the only way to watch this is the Japanese version. I watched both, and while the English performances were fine, the adapted script which only very loosely followed the original was confusing and horrible. The film was dripping in angst that wasn't in the original film at all. And cutting some of the most important sets of scenes from the original film which explained why everything was happening and transforming it purely into an action spectacle is particularly unforgiving for me.